There are still snowy conditions in some areas this morning. THERE IS A yellow weather warning in place until 10am today, with snow and ice a hazard on many routes around the country. Temperatures hit as low as -4 degrees overnight, as Ireland continues to be hit by a spell of very cold weather. AA Roadwatch is advising motorists to take extra care, particularly on secondary roads and sheltered areas. In Mayo, it’s still slippery on secondary routes in Claremorris, Foxford and Swinford. Gardaí report black ice in areas. Very icy on many routes around Roscommon town and the wider county. Secondary routes throughout Donegal are dangerous due to ice. Icy roads have been reported around Monaghan. Gardaí in Kerry say that Tralee is very icy this morning. 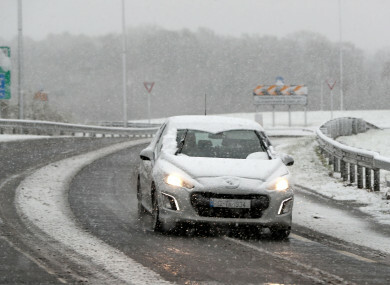 In Cork, conditions are particularly treacherous on routes in the Mallow area. In Tipperary, icy conditions are making secondary routes around Thurles dangerous. In Laois, road conditions are frosty around Portlaoise. Longford Town is particularly icy this morning. And caution is advised on the roads in and around Birr, Co Offaly. While a number of schools were closed yesterday, parents are advised that the school will contact them directly if the school will remain closed today. Met Éireann forecasts that rain will move into Atlantic coastal counties and will extend eastwards during the morning and afternoon, turning to sleet and snow in some areas. The rain will mostly clear later into the afternoon and this evening, with maximum temperatures of 4 degrees in the north and northeast and 10 degrees along southern and Atlantic coasts. Showers will become more widespread overnight, with hail and a risk of thunderstorms. The frost will then return on Wednesday and Thursday night, heading into the weekend. Email “Snow and ice warning on the roads with temperatures as low as -4 this morning”. Feedback on “Snow and ice warning on the roads with temperatures as low as -4 this morning”.